Along the Malecón: Cuban marchers shout "peace and love"
Cuban marchers shout "peace and love"
Young people, evidently not tied to any pro-government organizations, marched yesterday in Havana. 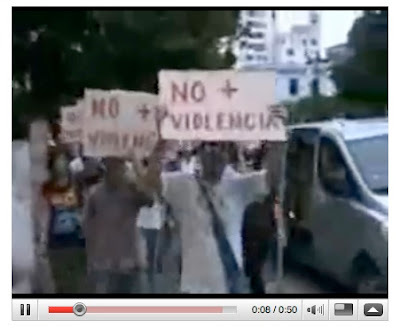 These kinds of public demonstrations are very rare in Cuba. Yoani Sanchez and three friends were headed to this march when they were detained. Here's the YouTube video of the march. 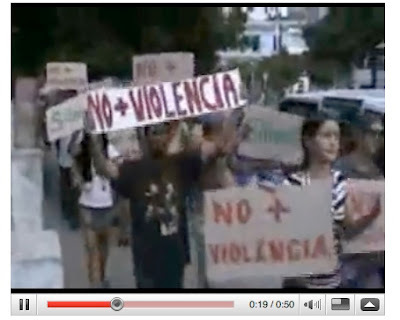 Participants carried signs that said "No to Violence" and shouted "peace and love." Yoani Sanchez: "I grabbed his testicles"